Personal training is much more accessible to the masses than you think. Off-peak hours and virtual training can all help to reduce per-session costs. Affordable payment plans can also reduce how much you have to pay at once for personal training. So many people are under the impression that working with a personal trainer is strictly for those with endless amounts of disposable income. That could not be farther from the truth! There are plenty of ways for anyone to find a personal trainer for less money than they may expect. Affordable options exist and are being made available by more personal trainers than ever before. As a potential client, it is up to you to put in the work to track down the best trainers for the dollar and seek value, as well as affordability options. There is no denying the benefits of a personal trainer. When you work with one, they will assist you with customized work-out plans. The trainer is going to be there to motivate you and also help you prevent injuries with improved form. Holding you accountable is another sound benefit of a trainer, among just the generalization that they will get you to try new things. Seeking the options that are available via the internet (and more) can prove fruitful for your training hopes! The first tip to finding a personal trainer on the cheap is to know what your budget is. What can you safely spend on a personal trainer — an amount that you can afford and also justify? Do you want to pay per session, or month to month? How frequent would you like the sessions to be? Get a firm grasp of where you stand budget-wise before you start your hunt, so that you have realistic expectations. #5 – How Much Does a Personal Trainer Cost? What can you expect to pay if you seek out a personal trainer? The average cost of a personal trainer is going to range from $30 to $100 per session, with $50 being the average. The price per session is going to vary based on a few different factors. If you take a group session, expect the price point to skew toward the lower amount. A full private session in a gym will be more in the $100-range, due to the overhead costs of the gym. Before the internet, the best way to get a personal trainer was to see who was available in a gym, which was also limiting to you as a consumer. Personal trainers work everywhere! Many of them have yoga studios right inside of their homes or full gyms to give you a unique workout and stretching experiences. Many trainers even use outdoor spaces like parks to work in runs, kickboxing, and so much more. Use the power of the internet to seek out personal trainers that are going to meet your needs. When you search online, you can find gyms with trainers, as well as trainers who work independently. The internet is also a great resource that allows you to compare gym membership fees, personal trainer profiles, and costs right from the comfort of your own home. You may be able to get set up with an affordable payment plan with the trainer you want to work with. It all comes down to asking questions about what they plan to offer you as a consumer. Will they give you a discount if you sign on for six personal training sessions at once? If you want to do three or four each month, can you pay monthly instead of per session? Typically, clients are not asked to pay a bill for many personal training sessions up front, and flexible payment plans can be offered. You merely have to ask and know what you can afford. This option may sound crazy, but technology has now allowed for personal training to be done virtually. Picture a trainer working with you over FaceTime on your iPad. A video screen can connect you with them, allowing them the freedom to coach you from anywhere, and you will not have to pay for a gym, equipment, etc. This option can lead to less expensive training sessions for you as a client. Some personal trainers may also offer you discounts if you can work out with them during off-peak hours. We’re talking mid-morning hours, like 10 a.m. to 12 p.m. 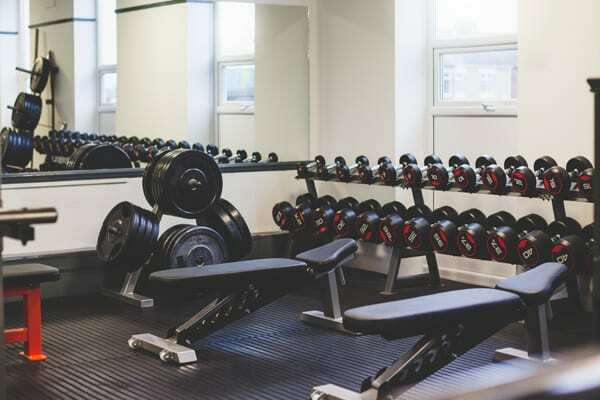 If you are fortunate enough not to be confined to a cubicle during those hours, you may be able to benefit from a discounted personal training session. Early morning, lunch hour, and evening times are typically the busiest. If you have a flexible schedule though, the discounts you can take advantage of really add up! Now, you may realize that a personal trainer is far more within reach than you probably think. You just need to get creative and put in the work to seek out the right one for you. Know what your budget is and seek affordable options that allow you to get the workouts you need — without breaking the bank. Personal training has so many benefits, and everyone can enjoy them after a successful search! We may be biased, but we can’t leave you with recommending you check out our Pro plan. You’ll get access to a personal trainer as well as workout plans, dietary suggestions, and advanced workout stats. If you’re the kind of person who thrives with someone in your corner and you have a smartphone, sign up for Pro today!